As many of you out there probably already know, I am a voracious twitterer. However lately twitter’s been having some troubles. Nothing that I’ve really noticed, just some things here and there, the most obvious one for me is that my twitter app on facebook has not been updated in a REALLY long time. SO yeah, I’m on Plurk, but I’m still gonna be on twitter coz most people ARE still on there, no point abandoning ship just coz everyone else is. Which brings up a very interesting point about being part of the zeitgeist, i mean the whole point of being on these social journal style things means that you’ll want to be seen and be heard, so if you migrate over to a new platform, you will have to rebuild these networks. So we’ll see how it goes. PS My Plurk User is jerricklim and the picture on my profile is of Me in bali! The ladies are back, their clothes are back, the men are back. And all that is left, the memories. 2 and a half hours of old school SATC wit, the banter, the levity followed by the gravitas of dealing with the complexities of living in the big city, with big dreams, hopes and Mr. Big. Jennifer Hudson’s appearance was welcome and interesting, but truly acting on all sides were just brilliant, New York was the other character that deserved top billing. The city is always beautiful, and always stylish. We missed the ladies but they have not missed us, their lives have moved on, they’ve become older but haven’t changed one bit and so we follow as they trot, strut and do it all. No spoilers. But yes it is worth every last penny if only to visit New York one last time with these eternal ambassadors. Clothes: Classic SATC with the “sense” that age brings. Style: Fabulous. Women: Timeless. I’ll miss you Carrie, Samantha, Miranda and Charlotte, if only because you could make me cry and laugh all within a short 30 minute TV show. already I’m so glad to say good bye. on the 3rd, coz I don’t have enough leave! See ya Singapore! Hello BALI! These are the pictures I’ve taken of this new store I’ve discovered at Cluny Court near my place. 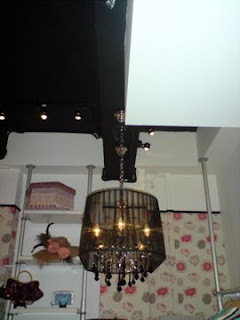 As you can quite clearly see its a store inspired by quirk and fabulousness. And I got to meet the fantastic owner (Holly Tupper) who’s settled in Singapore from New York! And all the stitching on the Polos seen on the second picture are HAND done. Which is quite impressive for this day and age and it gives the material a slightly rough hewn quality that is nonetheless very intricate and on top of all that the little patterns on them are truly beautifully designed. Comparable to those seen @ Shanghai Tang without the kitsch built in. I think this lamp fits in quite well with the whole vibe of the location. You can find Ms. Tupper’s boutique at 501 Bukit Timah Road, #01-01A Cluny Court. Oh and btw. One of the reasons I loved this little place so much is Ms. Tupper actually engaged and chatted with me, showed a genuine interest and talked about her clothes PASSIONATELY. Where is the local sales person who would do the same… Sigh. Just as an example, thos of you who know me know that I’m… Plus sized;) so I went to FlashnSplash @Plaza Sing, where the sales person gave me this incredulous look when I asked what their biggest sized board shorts were. Like I owed it to him to be thin… But i’m not overweight! I’m undertall! 1) Just because someone shouts out angry words and gets it published doesn’t mean that person’s WHOLE nation is collectively disgustingly insensitive and dumb. 2) So called “developed nations” have their “problem citizens” too. We don’t complain about them because their own citizens don’t complain about them. And now the meat of the article. In dealing with this article, I will not descend into demagoguery and idiotic populist exertions that this person being Malaysian is automatically biased and thus anything he says must be discounted. This is not the case, the author makes certain strong points and this kind of ungracious or discourteous behavior is seen all the time. However to make it seem like Singaporeans are the only people in the world who would do such a thing is not only disingenuous but blatantly false. Let me point out that whilst it is true that “A mature, developed country isn’t defined only by wealth and education; it is also about humanity and concern for others.” What is also true is that one who shouts louder or makes a more “newsworthy” statement tends to get his picture taken, comment recorded and invective published. It is however, not by any stretch of imagination an indication of the true behavior of the masses. Just because such “news” is more reportable, doesn’t make it the norm present in all nations. I should also point out that such “developed nations” as France, Italy, and the United States possess people who would laugh at the sleeping homeless person on the road, spitting on his weather beaten face. They shock and appall all those who would pass them by, but it has been recognised that in these places its just what happens. What maturity, and development! These people have recognised that ultimately not everyone will follow the ONE word given by the government. As such, I don’t believe ultimately that the behavior of these boors and louts should establish how “developed” a place is, but the response provided should. Is the self-righteous anger followed with half hearted attempts at fixing the root problem? Or is this something that people realise that not everyone can fix, and ultimately a gentle, more subtle touch is required? That is the sign of maturity I think, not hundreds of posters, and thousands of angry blogposts. I do not pretend to know if there is a way to end all such behavior and to pretend to have 1 solution to all the problems is arrogant and ultimately self defeating. I don’t like to say this but, this issue is about as simple as baking a great souffle. There IS no black and white answer. Sure there are “ugly Singaporeans” but someone who’s an ÜS today, could be the best tourist Beijing has ever seen tomorrow. It so often depends on the person, and no amount of posters, and training and corporal punishment will change that. I’ve learned to shrug, just like the French. Because I know something’s just meant to be, and we can all take it with a croissant, une petite café and a pack of gitanes. Impossible for Obama to win over the Islamic World? Is it really impossible for Obama to win over the Islamic world simply because he was BORN a Muslim? Seeing as how Obama’s father’s is Muslim, thus he becomes Muslim. His conversion to Christianity will be seen as Apostasy (an act punishable with execution in many Islamic countries and is seen as akin to treason or betrayal in most) to many around the Islamic world, of which there’re many important friends and foes, (Saudi Arabia and Iran accordingly). The central premise of this article argues that having a President Obama will irreparably damage relations between such nations and the USA or at least be caught in a situation where relations will not improve. Is it really going to be like this? Will religious fundamentalism win out? I certainly hope not. What do you think? First off, and this is a tangent but… BEING LIBERAL IS NOT THE EQUIVALENT TO DOING SOMETHING WRONG. ABSTINENCE EDUCATION AS A NUMBER 1 PRIORITY HAS BEEN PROVEN TO FAIL AND WE SHOULD REDOUBLE OUR EFFORTS AT PROMOTING IT? HAVE YOU NO LOGIC WHATSOEVER? With that note I begin my little talky talk about Speed Racer. I’ve heard so many bad reviews from around me that truly, I was feeling very skeptical. All such thoughts disappeared the moment I stepped into the movie theatre *albeit a little late; Damn* The sequence I caught was quite cute and in some ways an homage to the original SR series from Japan. Just a quick background flashback, the original Speed Racer was from the 60s and was really the first successful Japan to USA anime crossover. It was based on a manga and was basically about, to quote wikipedia: “a teenage boy with superior skills (in this case, racing skills) facing unreal adversity through a multitude of villains” and it really was every boy’s dream, to be like Speed, defeating enemies and winning the race. I has some love for this cartoon as a child and that was why I was so excited that it was coming over to the BIG screen. Speed Racer the movie, on the other hand is done by the Wachowski Brothers, the same people behind V for Vendetta and the Matrix series. On a little side note, the music was done by Michael Giacchino, and was truly amazing. The movie itself was a riot of colour, with brilliant action sequences and a cast that really were as they were, each and everyone of them cast perfectly. Homages abound with the “fights”, though I use the term loosely, and the truly hyperkinetic action of the races. Rain’s appearance was a little Huh? and I though Susan Sarandon’s appearance did take some of the shine away from the other actors who were competent, if not great and the villian *who was also in V for Vendetta* has crystalised in my mind as the quinessential British villian. There are naturally some problems, some problems that are sure to be a deal killer for some people. Chief among them is the whole cartoony look of it all, YES, it is effectively a live action cartoon, no one for any minute doubted that and to fault the movie for it is idiocy. It has a plot that occasionally slips into typical American melodrama, which is typical but not unexpected and is really the only flaw I can think of. I feel however, if you can enjoy a cartoon, you can and will enjoy Speed Racer. I loved Speed Racer, it appealed not only to the kid in me, but the action fan in me, and anyone who even has a shred of the need for speed in them should watch this movie. The fact that the movie kept me in the “zone of interest” where I believed and enjoyed the movie the whole time is a testament to the Wachowski brothers’ film making ability.